The donations had a total value exceeding $3 million. NEW YORK: Feeding America received several large corporate donations this week to provide relief to government workers affected by the shutdown through its network of food banks. 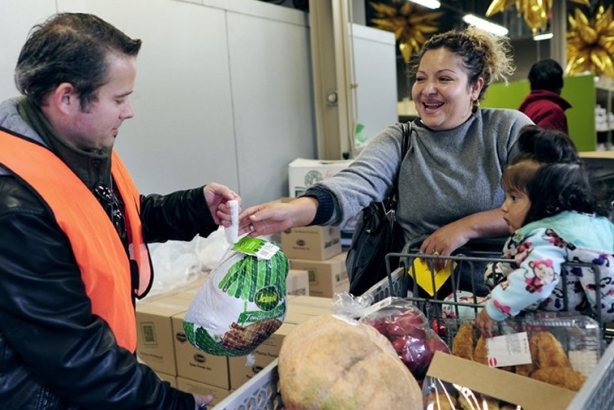 The Visa Foundation donated a $1 million grant, Walmart donated $100,000, and Unilever donated food supplies and personal care products with a retail value of $2.1 million to Feeding America’s Shutdown Response Fund. In addition, Visa said it would double any donations its employees make to Feeding America, according to a statement. For example, if an employee donates $1, Visa Inc. will donate $2 for a total of $3. It’s also encouraging its workers to volunteer at their local food banks. Despite Congressional leaders and President Donald Trump reaching an agreement to temporarily open the government on Friday, Visa said it would continue with its donations as planned. "[We were looking to] find an organization we could partner with that would help us reach as many people a possible that were impacted, including federal employees, contractors, and their families," said Amanda Pires, Visa’s VP of communications. "It was an efficient way to make an impact in a timely way. Most food banks are very local and they have a national network to reach local communities efficiently." The Visa Foundation made its debut in 2017 with a grant of up to $20 million to Women’s World Banking, dispersed over the course of five years, to aid women entrepreneurs. "The positive response from our employees is overwhelming and we want to make sure the culture of the company [is such that it] takes actions that represents what our employees want us to do for the community," Pires said. Besides its donation to Feeding America, Walmart also gave $100,000 to the United Way’s United for U.S. Fund and the Coast Guard Foundation, according to a statement. Unilever’s care packages included: Hellmann’s condiments; Knorr Mealmakers; Suave hair care, body wash, hand and body lotion, and deodorant; Dove body wash; St. Ives body wash and hand and body lotion; Pond’s face cream; Axe body wash; and Seventh Generation diapers and feminine products. Unilever has partnered with Feeding America for 40 years through financial support, product donations, and employee volunteerism, according to a statement. The government shutdown, the longest in U.S. history, started on December 22 after Trump rejected a bipartisan government spending bill that didn’t include $5.7 billion in funding for a U.S.-Mexico border wall.